Racial, religious profiling root of terror cases? WASHINGTON (FinalCall.com) - Even as federal officials insist that each newly exposed “terror” plot is worse than the last, many observers fear that the rash of prosecutions, almost exclusively involving Muslims and Blacks, are part of a backlash that is building throughout the country. Attorney General Eric Holder called the latest arrest, the alleged hydrogen peroxide bomb plot that led to the arrest of Denver shuttle bus driver Najibullah Zazi in September, one of the most serious terrorist threats to the country since the attacks of Sept. 11, 2001. The FBI continues to hunt for those who may have been involved with Mr. Zazi, Mr. Holder told reporters Oct. 6. He described the alleged al-Qaeda-inspired threat as a plot which may have been intended to kill “scores” of Americans. Many Muslims, however, feel they have been targeted, and that Muslims collectively are being blamed for the 9-11 attacks. A poll released in September by the Pew Forum on Religion & Public Life found that 38 percent of Americans believe Islam is more likely than other faiths to encourage violence. In response, it is now common in mosques, as well as in telephone conversations for Muslims to preface their remarks by saying they know the government is eavesdropping, but that Muslims have nothing to hide. But the federal government has prosecuted Muslims even for humanitarian assistance to suspect Islamic organizations. “Instead, what triggers the crime is simply your doing anything of value for any group that has been put on a blacklist by the secretary of state,” Mr. Cole continued. “Our clients, Humanitarian Law Project, had been providing human rights advocacy training and peacemaking negotiation assistance to the Kurds in Turkey, essentially encouraging them to use lawful, nonviolent means to resolve their disputes with the Turkish government, by going to Geneva and filing human rights claims, by participating in peace talks and the like,” he said. The contested material support law was first adopted in 1996. The Obama administration defends it as a vital part of the nation's effort to fight terrorism. One conspicuous case is that of the “Liberty City Six.” Five of the six were convicted in May of plotting to join forces with al-Qaeda to destroy Chicago's then Sears Tower and bomb FBI offices in hopes of igniting an anti-government insurrection. A jury in Miami acquitted another member after six days of deliberations. Two previous trials ended in mistrials when jurors could not agree on the men's guilt or innocence. Most of the convicted men are Haitian or have Haitian ancestry. They lived in Miami's downtrodden inner-city neighborhood known as Liberty City. They were arrested in June 2006 on charges of plotting terrorism with an undercover FBI informant they purportedly believed was from al-Qaeda. 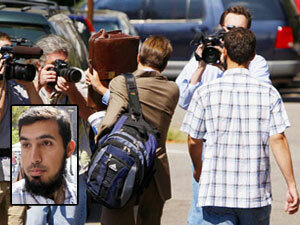 Defense attorneys said terrorist talk recorded on dozens of FBI tapes was not serious and the men only wanted money. This is all evidence of racial and now religious profiling, according to Dr. Walters. “To that extent, yeah. It's something we ought to be concerned about. For our community it's just another indication of what we have been going through all along, except this time it's tacked on religion,” Dr. Walters said. “The material support laws that we're challenging in the Supreme Court were a broad brush effort to go after lots of people without proving that they engaged in any criminal activity,” said attorney David Cole. “Well, another way that the government did this after 9/11 was not by passing a new law, but by exploiting old laws for purposes they were never designed to serve. And the material witness law is such a law. It gives the government the power to lock up somebody who has not committed a crime, but it has to show that that person has relevant evidence to an ongoing criminal proceeding and, if he were served with a subpoena, which is how you usually get someone to testify, he would flee,” he continued. Mr. al-Kidd was one of at least 70 people detained under the warrants, according to a study by civil liberties groups. Like many others, he was never called to testify before a grand jury or in open court and was not charged with a crime. The legal practice, which continues today, began less than two months after the Sept. 11 attacks, then Attorney General John Ashcroft said the government would preventively detain people suspected of terrorist ties, even if it had no evidence they committed a crime. To hold them, the Justice Dept. used material witness warrants, which until then had detained people to ensure they would appear in court and testify at a trial. In addition to the Supreme Court case, some of the suspect provisions of the Patriot Act are up for renewal before Congress. Those provisions, which are due to expire at the end of the year, would allow the government to collect a wide range of financial and personal records, as well as to monitor suspects with roving wiretaps.